What does it take to be a global CEO? “It’s not just about managing day-to-day operations. I think Indian CEOs have the DNA to become next-generation global leaders. They enjoy their jobs and recognise that they are privileged to lead. 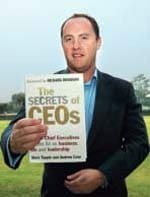 They are not only strong, but also share the same passion to win with their core leadership team,” says Steve Tappin, Managing Partner in the Global CEO and Board Practice of Heidrick & Struggles and coauthor of the bestselling book Secrets of CEOs: 150 Global Chief Executives Lift the Lid on Business, Life and Leadership. Tappin says that Chinese CEOs are still far behind their Indian counterparts in terms of competency. “First, the experience of Chinese CEOs in running global businesses out of China is limited in comparison to Indian CEOs. Other challenges include cultural and communications barriers,” says Tappin, who believes that as the global economic crisis deepens, there will be a severe shortage of truly global CEOs in the market. As a result, India will be the hunting ground for such people.